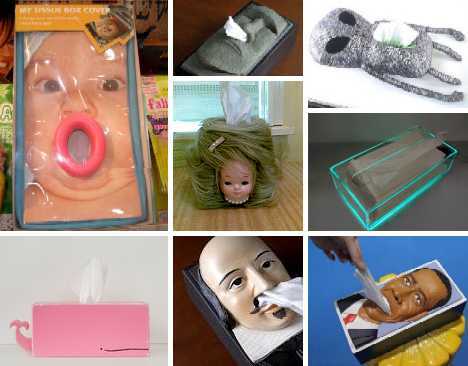 First World Problems don’t come tougher than choosing a tissue box cover, which is why we’re presenting a dozen of the odder redundant décor accents out there. Legend has it that dugout canoes paddled by the ancestors of the Easter Island tribes were blown to their distant destination on Rapa Nui by the humongous sneeze of a gigantic stone Moai… yeah, that’s the ticket! 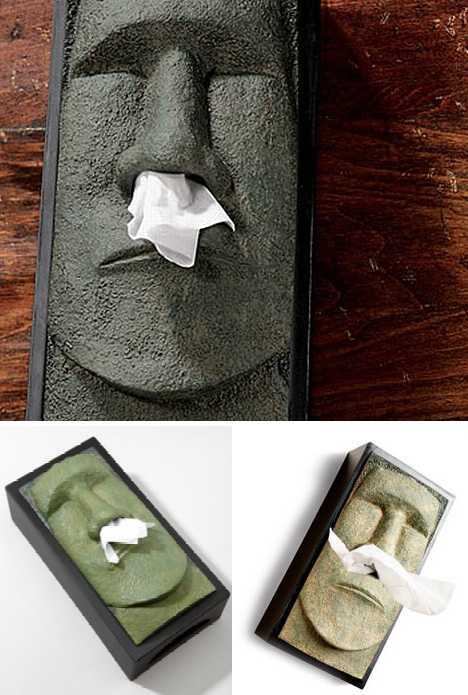 Now you can celebrate the “viral” spread of ancient ocean explorers with your own mini-Moai Tissue Box Cover, sporting a perpetual paper post-nasal drip to assist your recovery from rampant rhinovirii. 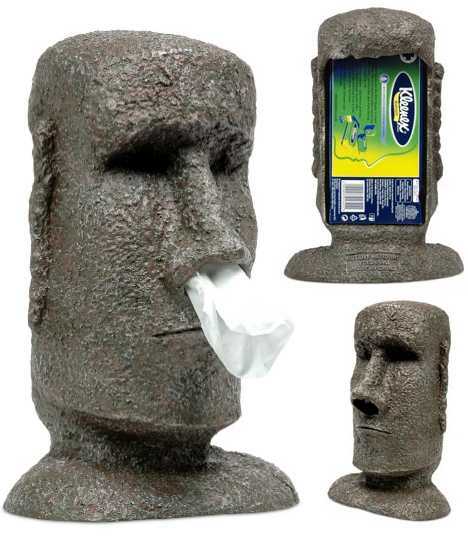 One wonders what the mysterious proto-Polynesians who first colonized Easter Island would think of their trademark statues, laboriously carved from hard volcanic rock with rudimentary stone tools, being rebooted as kitschy tissue box covers. Then again, after causing an environmental disaster by chopping down the island’s trees the natives wouldn’t have had tissue boxes or tissues – not a square to spare. Old & busted: YouTube. 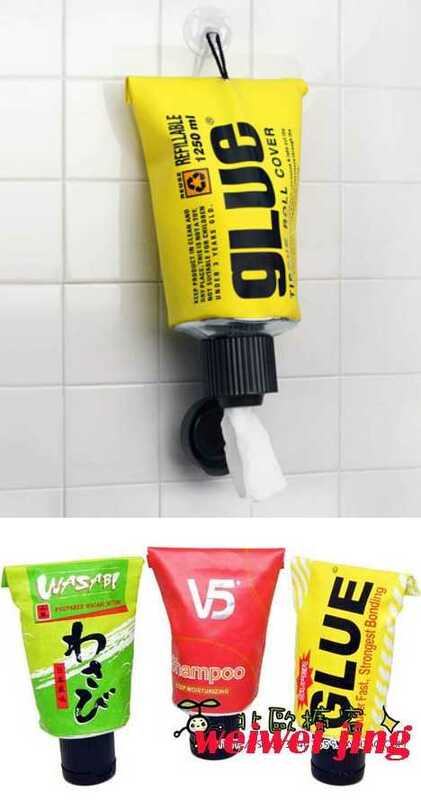 New hotness: Glue Tube! 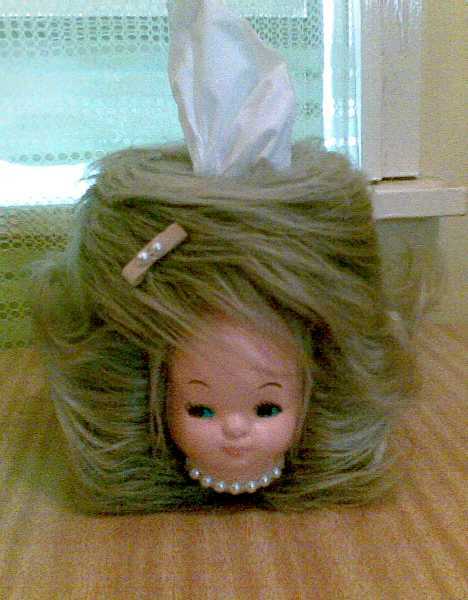 The Glue Tube Tissue Box Cover cleverly conceals your tissues within an oversized faux tube of airplane glue. No word if the manufacturer also makes glue containers shaped like tissue boxes but maybe it’s just as well: an errant reach could leave the user looking like an allergy-plagued Easter Islander. Bonus: they also come in Shampoo and Wasabi styles. Some folks catch a case of the sniffles and turn their illness into a whole dramatic production. 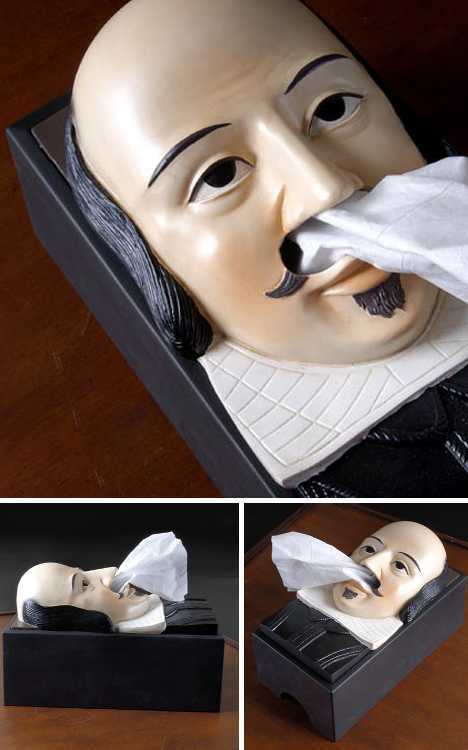 Let ’em know they’re laying it on a little to thick by presenting this Shakespeare Tissue Box Cover! Embossed with the bald bearded British bard himself, this is one tissue box that won’t close after opening night. 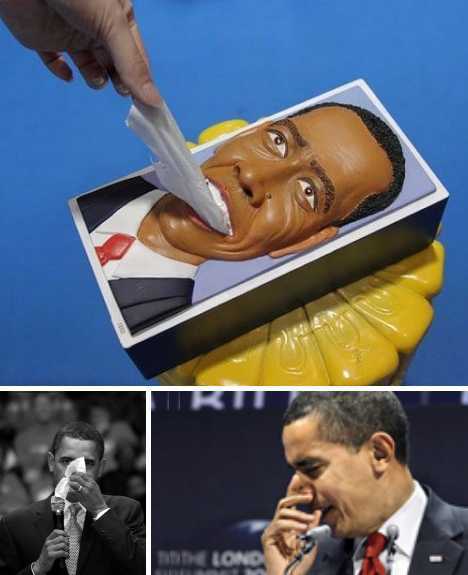 Liven up your next tea party with the Obama Tissue Box Cover. Those whose political persuasions lean well to the right would love nothing better than to blow their noses with an Obama speech – and now they can. Yes We Can… honk our honkers care of America’s 44th president. Nintendo’s Famicom is credited with nearly single-handedly reviving the North American video game market after the Great Video Game Crash of 1983. 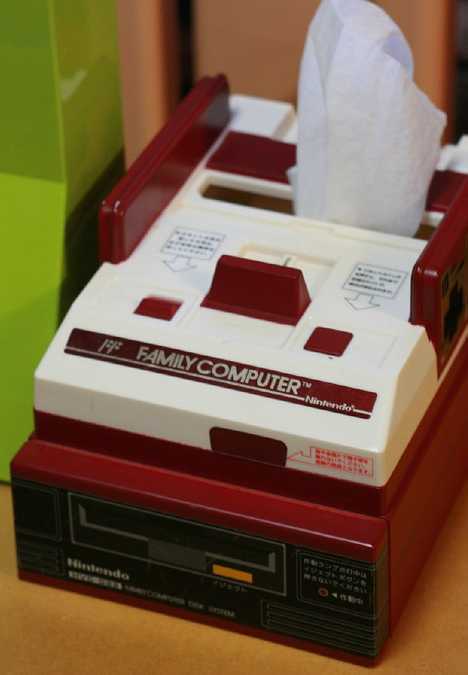 As well, the familiar Famicon console case sparked a number of memorable case mods including one officially approved of by Nintendo and manufactured by Banpresto: the Nintendo Famicom Console and Disk System Tissue Box. 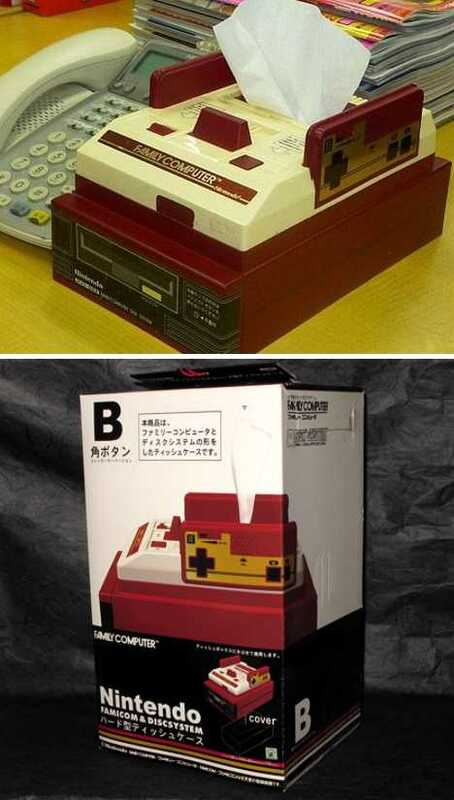 Sold for around $30 each, Famicon Tissue Box Covers proved to be as popular as the actual game systems. Obviously such a product would have to satisfy Famicon fans of the most rabid variety and it does just that, being produced in both Version A with a circular fire button and Version B with a square fire button. Creepy is as creepy does, and in the dictionary under “creepy” you’ll see this zombie abomination of a tissue box cover. Of course, if you ARE a zombie and you’ve got a nasty head cold in your cold dead head, the thought of yanking a brain tissue, as it were, from this wigged wonder would be an enlightening (though not enlivening) experience.